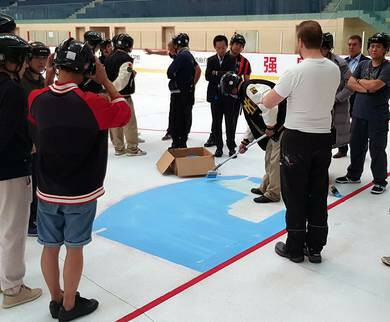 The International Ice Hockey Federation (IIHF) held an ice making seminar in Beijing as preparations continue for the 2022 Winter Olympics in China's capital. Organised by the IIHF's Facilities Working Group alongside the Chinese Ice Hockey Association (CIHA) and the Huaji High School, the four-day event took place at the Huijia Jade Snow Ice Arena. Members of the Beijing 2022 Organising Committee were among those in attendance at the venue which is home to the Huijia Green Dragon ice hockey team. They were there to "observe and evaluate potential staff additions" to the ice crew who will handle the men's and women's Olympic tournaments at the Beijing National Indoor Stadium and the Wukesong Ice Hockey Arena. More than 50 people were in attendance in all, including staff from the CIHA and local ice hockey arenas. IIHF vice president Thomas Wu was also among the representatives. "At the IIHF, we always speak of development and transfer of knowledge and through the IIHF Committees," said the Facilities Working Group's secretary Cornelia Ljungberg. "The IIHF Facility Working Group has worked on its purpose of existence and that is to teach IIHF Member National Associations to prepare the right playing field for our players and game officials and of course the fans in order to have them watch the best hockey possible at the 2022 Olympic Winter Games in Beijing, China."